If you like Pumpkin Chocolate Chip Cookies, try this recipe. Yum! Pour into greased cake pan or glass casserole dish. Then top the batter with more chips and pecans, so you won't need frosting. Bake 350 for 26-30 minutes, test center with toothpick. I make this every year for my dad's b-day in Dec., and it is fantastic! Super sweet, but very delicious. This would be great to serve at a large gathering since you can get away w/ smaller pieces. I think it is a wonderful holiday cake! Preheat oven to 325◦. Grease and flour 9x13 pan. Mix first seven ingredients with a spatula until moist and pour into pan. Mix brown sugar and nuts together and sprinkle over the top of the cake as evenly as possible. Bake 45 min. or until a toothpick inserted in the center comes out clean. Take cake out of oven and poke holes (using a fork) all over the top of the cake. Stirring constantly, cook over med-high heat until all the sugar dissolves. Bring to a boil and cook for 3-5 minutes. Pour sauce over the top of the hot cake and allow to soak in. 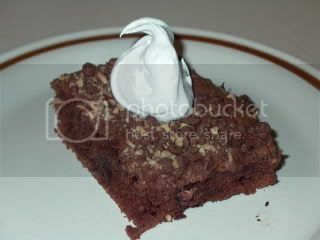 Serve w/ whipped cream if desired. "Annual income twenty pounds, annual expenditure nineteen nineteen and six, result happiness. Annual income twenty pounds, annual expenditure twenty pounds ought and six, result misery. " My husband's family is having a Christmas luau, so I'm going to make pina colada cake, from a mix. I'll let you know how it turns out. Bake a yellow cake mix per instructions on the box, adding rum extract, or up to 1/3 cup of the real stuff in place of some of the liquid. When cool, mix one 3.5 oz. box each of vanilla pudding mix, coconut cream pudding mix, 2 cups milk, rum flavoring or a splash of the real thing and 8 ounces of softened cream cheese. Spread onto cake. 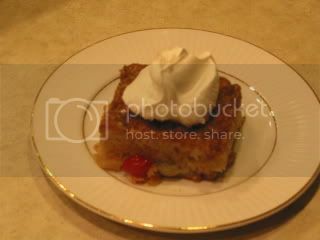 Top with two 20 ounce cans of drained crushed pineapple, then cool whip, and garnish with toasted coconut. My favorite scratch chocolate cake is this one. It is always moist and delicious, and best served with my grandmas old fashioned icing which isn't too sweet, below. Bring water to a boil, add baking soda, set aside. Cream butter, sugar and eggs. Mix in dry ingredients, alternating with milk. Add baking soda water and vanilla. Bake at 375 degrees. Cook flour and milk together until thick. Remove to a bowl, cover with plastic and chill. In a bowl, beat softened butter and sugar together. Add cooled flour mixture (which is supposed to look like a lumo of glue, don't worry) to the butter mixture and beat on high until light and fluffy and you can no longer feel the grainy sugar, add vanilla and spread onto cooled cake. Mix all together. Spread 1/2 of the batter into a greased 9x13 pan. On top of that batter, spread evenly a mix of 1 cup brown sugar, 2 Tablespoons (I always like a lot more than that) and whatever kind of chips you want. Spread remainder of batter on top. Bake at 350 degrees for 35-45 minutes. Frost with a glaze of powdered sugar, butter & orange juice. Mix all together. Spread 1/2 of the batter into a greased 9x13 pan. On top of that batter, spread evenly a mix of 1 cup brown sugar, 2 T (I always like a lot more than that) and whatever kind of chips you want. Spread remainder of batter on top. Bake at 350 degrees for 35-45 minutes. Frost with a glaze of powdered sugar, butter & orange juice. Is that 2 T of cinnamon---between the 1 C brown sugar and choc chips? Did you know you can make your cake with beans as a replacement for oil and you cannot tell a difference. I served my son's b'day cake this way and everyone was surprised at the end of the night. Even the pickiest of eaters. Suggested to use lighter beans white, great northern, etc for lighter colored cakes and darker beans for darker colored cakes. For carrot cake you can even use a pinto bean. Just puree before using.